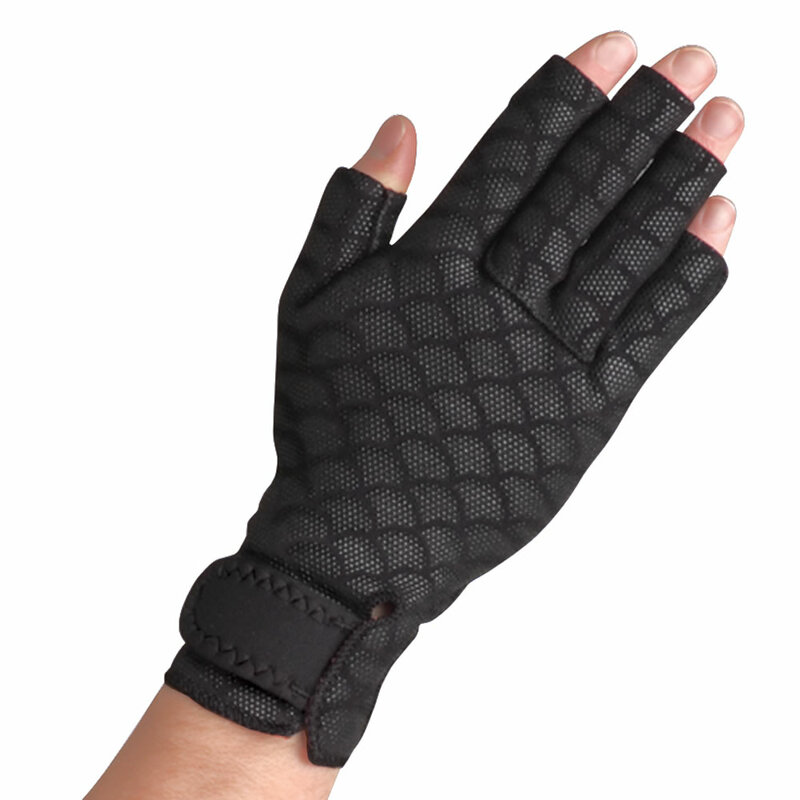 This pair of gloves stimulates blood circulation in the hands, promoting relief from arthritic pain while you perform your daily routine or while you sleep. The gloves exert a gentle compression and are lined with a patented material that facilitates blood flow throughout the hands to reduce swelling, improve the mobility of joints and ligaments, and help relieve arthritic pain. A study by the University of Technology in Sydney, Australia showed the gloves provided "considerable relief" or "total relief" of pain in 83% of patients. The gloves wick away moisture and allow hands to breathe to ensure comfort during extended wear. The gloves leave your fingertips exposed and are made from a flexible material, allowing you to grasp objects or dial a phone while maintaining tactility. For proper sizing, measure the circumference of your hand around the knuckles. One Pair. Unisex. To ensure a proper fit in our gloves, we encourage you to measure your hand to determine your glove size. Hold your hand flat, palm side down. Wrap a measuring tape tightly around your hand, making sure to measure the widest part of your knuckle area, all the way around your palm and back. Make a fist with the measuring tape in-hand, making sure it is still over the top of your knuckles. The resulting measurement in inches is your hand size. If in-between sizes, order the next size up. The All-Day Arthritis Pain Relieving Gloves come with The Hammacher Schlemmer Lifetime Guarantee. Items that we sell are guaranteed for their normal life under standard non-commercial use. Should you have any questions, we are available seven days a week (8:00 am – 9:00 pm EST Mon-Fri and 8:00 am– 6:00 pm EST Sat-Sun). Please call 1-800-321-1484 to speak with a specialist or email us at customerservice@hammacher.com to receive a response within 24 hours or less.